Family habits are a funny thing. Your family is, as your family is. As a child you believe what you’re experiencing is normal and everyone has a family similar to yours. Depending upon your life and who you meet along the way will determine how quickly you discover normal doesn’t exist and that thing your family does isn’t necessarily a thing other families do. I’ve spoken of some of these habits before. Some of these differences are minute. Tiny little differences you only observe once you start living with someone who grew up in a different family. Like, do you leave the pegs on the line, or off? I inadvertently discovered that my family’s rules for washing jeans are not universal. We always dry them inside-out because it frees up the pockets and allows them to dry faster. My husband’s family always pegs clothes by the ankle, my family always pegs socks by the toe. As we were bringing in the washing today I was reminded of another ritual that never ceases to make me smile. I find it endlessly and ridiculously amusing which my husband finds similarly amusing because we’ve really been married long enough now that I really should be over it. And when I tell you what it is, you’ll be underwhelmed. As we fold the sheets, I’ll pull on my right hand corner and he’ll pull on his right-hand corner, diagonally stretching the fabic taught. You’ll then do the same from the left-hand corner. He says it makes sense, it squares-up the sheet and be that as it may, it’s still funny. What are your family’s quirks? My proclivity to collect things panics me at times. At the top of this list – I worry I’m materialistic. I worry that my anti-materialistic beliefs are hypocritical owing to the plethora of stuff in my house. I don’t feel I’m money-oriented, I don’t feel excessively concerned with material possessions. I like to think I’m a protector of objects. Team Tiny Pepper! GO TEAM! You know how, sometimes, when you have a drink with a straw in it, and you’re not paying attention. You go to take a sip, and the straw has floated up in the glass, so you poke yourself in the face with it. Or your straw has a mind of its own and your mouth is tracking after it and this goes on for longer than it probably ought to. And you don’t look up from your glass because you know your partner is staring at you with an amused look on their face. This sums up my day. Team Tiny Peppers can be found here! I love music, but I’m not particularly musical. I can play the piano but I’m somewhat restricted by my repertoire. I have zero gift for improvisation and I’m unable to play sheet music at first sight unless the tempo is glaciale (yes, I made that up) – and even then, I can make no promises. My preferred audience is my cat, but unfortunately he hates me playing and will either meow at me, make a point of leaving the room, adjust his sleep position to ensure he’s on his ears or jump up onto the keys/hands/lap/anything-that-might-make-me-stop. My personal favourite is when he plonks himself on the low notes and just stares at me. I’m also pitch imperfect which, on a positive note, allows me to play my old and un-tuneable piano. Miraculously, my husband who’s has perfect pitch has not yet divorced me. I love music though and I rarely do anything at home without a soundtrack. Although musically inept, I’m ridiculously pedantic about certain musical etiquettes. This IS entirely MY problem but I wish to enlighten anyone willing to listen so we can share the same, inane first-world-problem. And then we can be frustrated together – yay! Rhythmic displacement – otherwise known as clapping on the wrong beat. Its disjointed effect and its seamless correction is shown in the clip below by the skillz of Harry Connick Jr.
Also, I have an issue with applause. I promise, I’m not anti-clapping per se. How can clapping even be wrong? Well, since I asked myself on your behalf – it can be wrong at classical music concerts. I struggle when people clap between musical movements. Which is, essentially, before a piece has finished. The last concert I attended accentuated this issue – The Symphony of Sorrowful Songs by Henryk Górecki. If you are unfamiliar with this work, it is as it sounds – profoundly slow, expressive and mournful – the words taken from the walls of a Gestapo prison. The first time I heard it in my teens, it froze me in my tracks. It is exquisitely beautiful and emotive. The silence is part of it. More than any other piece, it deserves the silence. So, any thing small but musically significant frustrate you? I will not accept answers which include folk who are, allegedly, musicians. Meanwhile, I’ll be on a musical bridge getting over it. When I was seven, I stood by a basket of toys for sale. My grandfather said I could pick one and being the sort of person that loved everything, and despite the fact they were essentially identical, I ran my hands through them for some time as I decided which one I would take home. These days, you’d barely call them toys – they consisted of a pair of googly eyes attached to a strip of dyed sheep’s skin and they ‘crawled’ along when you stroked them. I took the one with a google missing from its eye. The little black dot that rolls around beneath the plastic dome. I took it because it was different. I took it because I didn’t think anyone else would appreciate it. Maybe this explains a lot about the kind of things I collect and save now. 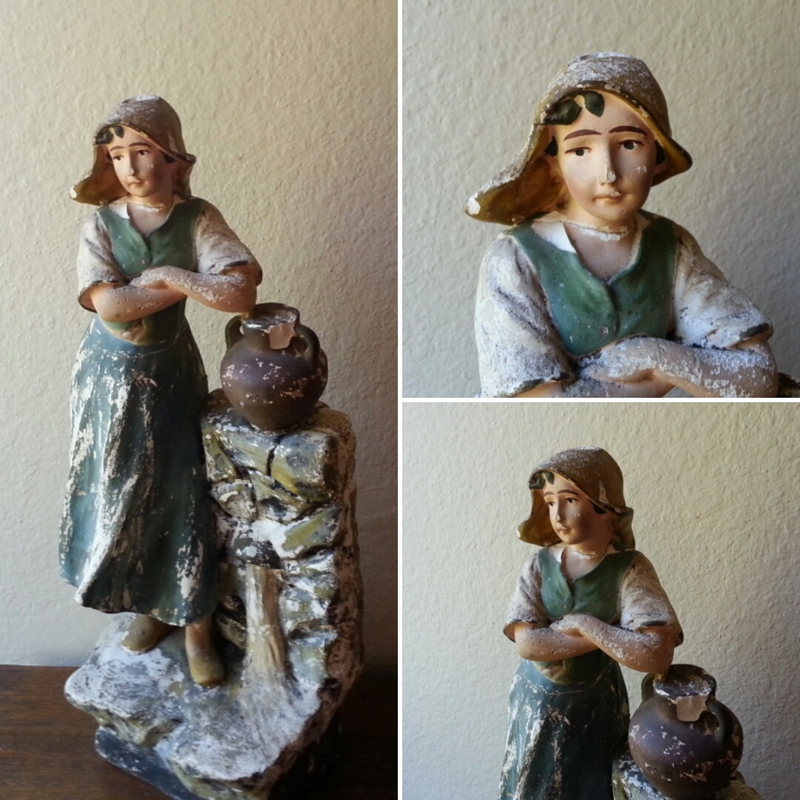 Chipped all over and glued back together in three places, this plaster girl with a distant gaze and great eyebrows asked me to take her home. On the left, the dome-girl with no hand. 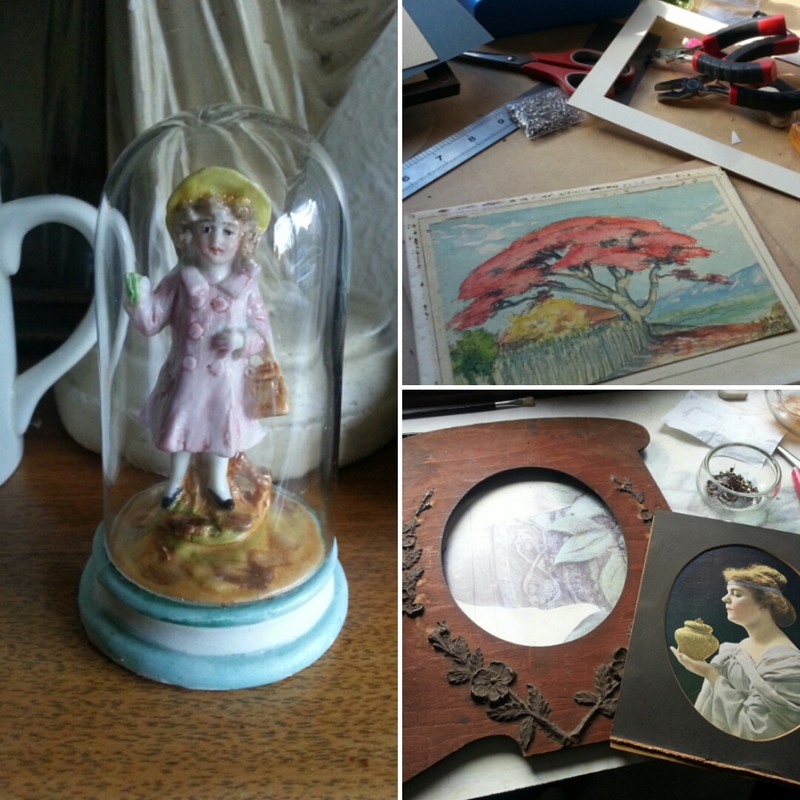 Top right, a mouldy watercolour to be cleaned and reframed. Bottom right, a print (circa 1910) in a damaged frame. I don’t necessarily restore the pieces I save. Broken is more honest. Sometimes, I toy with the notion that I would have been a great detective. You know, had the opportunity knocked. Had Sherlock Holmes needed a Wally instead of a Watson. Had Poirot been the sort to hire a sidekick. Had both those characters been real outside of my mind. I love a mystery. I love a story. I love the stories of objects. This bring me to the Bible of Jesse Wallis. I’ve mentioned before that I have a collection of old Bibles and prayer books. Not because I’m especially religious but because they are so tactile and so treasured. I think of the hands they have touched as they were passed through the generations. 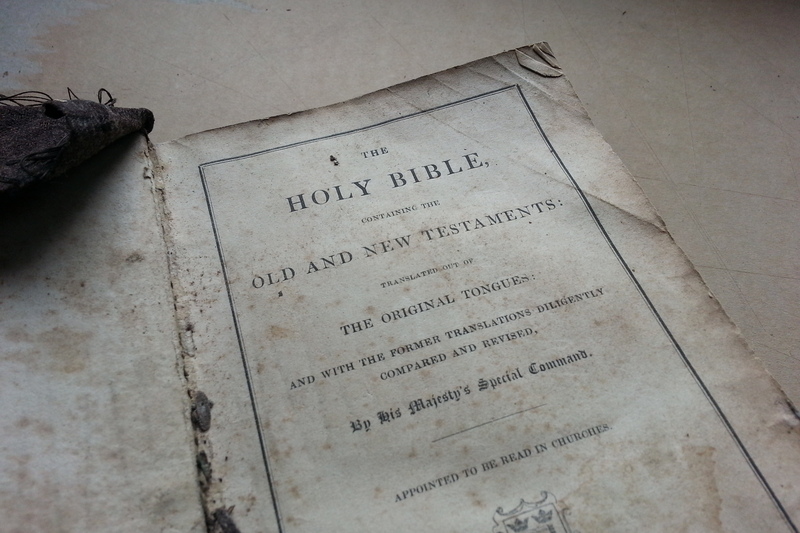 Of course, I bought it at a market and although it’s not in the best condition, it’s dated 1847. 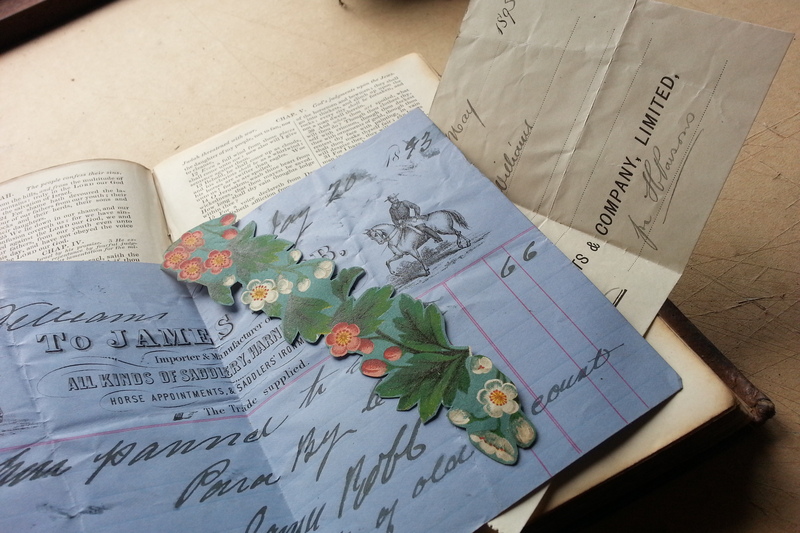 Pleasingly, when I got it home I found it was full treasures – two receipts from a saddlers dating 1895, a bookmark and a love token probably dating from around 1915. 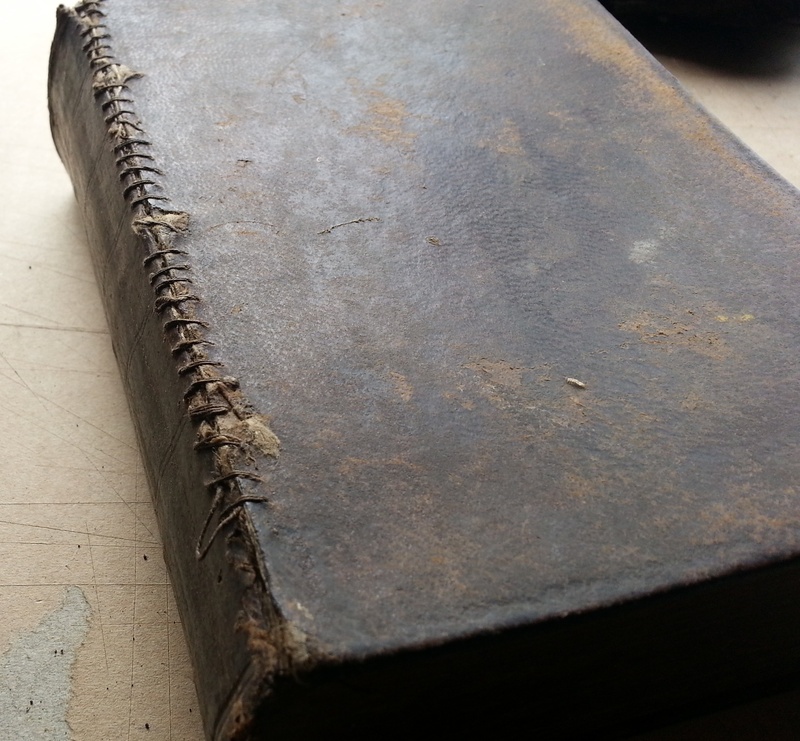 The inscription on the inside cover tells me it was gifted to Jesse by a clergyman. The back of the book lists the date of his marriage and the births of his children. How can I not ask more questions? How do I contain my curiosity when I possess enough information to know more? Like many colonial Australians, Jesse was a convict. More unusually, he could read and write. His records say he was 5’3” and was born in Berkshire. At the age of fifteen he was found guilty of arson and received fifteen years transportation. His convict record was exemplary – his report card is blank – instead Jesse states he’s innocent of his crime. He received his ticket of leave within five years (like parole) and was pardoned in ten. What of his family? What happened to them after he was transported? The detail of his records allowed me to trace his family back to England and the 1841 UK Census. A search on his father revealed he too was convicted with his son and received transportation for life! I traced his mother to the 1851 Census and she listed herself as a pauper and a widower. I could not trace his brother. The receipts contained with the Bible pertain to Jesse’s daughter, so the Bible remained within the direct family for at least two generations. This is what happens. Whenever I have an object that peeks into another life – I must explore it. What happened? How long did they live? Often I struggle to stop. Once, such research allowed me to reunite a photo album with its family. I once found a book belonging to a friend’s great grandfather. I observe the movement of objects. I recognise the history objects contain and I protect them until there’s (hopefully) another person who values that too. I planned to do that whole A to Z thing. And I WILL recoup. But I’ve been away on a happy knick-knack collecting adventure with my mum. So I’ll have EVEN more to offer. Possibly. Alledgedly. Anyhoo. To get back into the swing of things. There’s this list post that is all the rage right now. It started here with Mer, found its way to Jackie and you’ll find it here with Ra. I’m completely stealing all their ideas because I’m lazy. Here are fifty facts about me. I’m lazy. I often don’t tidy up after myself due to the following circumstances: a) I might/will need it again soon b) I haven’t got time to pack it away properly c) I can’t be bothered. However, when I’m in tidy mode I am an organised machine. I usually only lose things because someone else put it away. I have always chosen security over experience. I don’t take risks. On three occasions I’ve had friends who’ve envied me simply because their parents liked me. I only learnt this years later. I have only ever travelled overseas once and have collectively seen more of the UK and Ireland than I have of Australia. My family are big on nicknames. I still answer all of them. When I was ten, my dad sent a letter to me using my nickname and I was mortified that the postman had seen it. I hate arguing and I have never shouted in anger. Oysters make me gag. Up until my teens, so did green beans. I don’t drink enough water and too much alcohol. 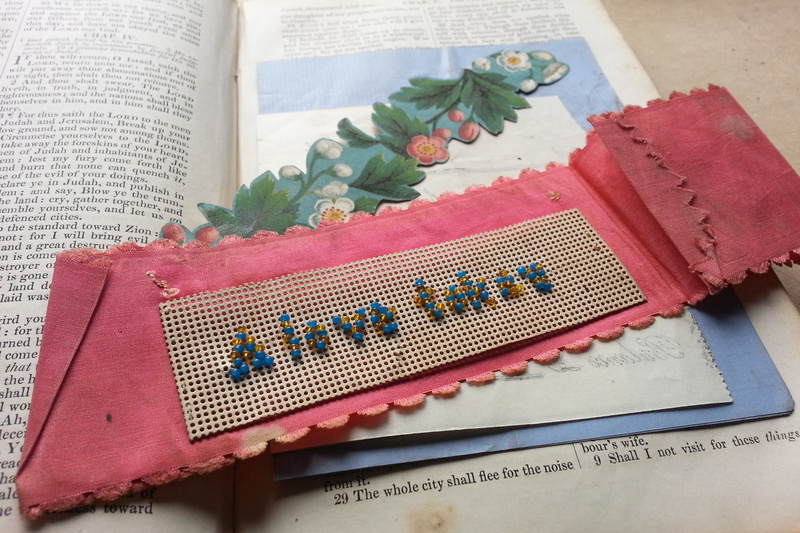 I am always working on a project of some kind. I’ll probably finish half of them. This month it’s crochet. I like clothes but I don’t like shopping for them. My favourite footwear is socks but I shoe-up at appropriate times. I once ate a meal after I removed someone’s hair from it. I have to cut up fruit before I eat it because eating a bug or discovering rotten flesh would put me off fruit for months. I like people to say what they mean, even if it hurts. I cannot stand talking on the radio – interviews or any form of commentary. If you want me to listen, you have to be mega interesting. I listen to Christmas music all year long. I’ve never broken a bone. I won a drawing competition when I was eleven. I drew a guinea pig and won an illustrated book of Aesop’s fables. I would love to be able to sing. Like properly and in tune. I would rather speak in front of thousands than play the piano for one person. I have an aversion to nail polish on my own finger nails and I don’t understand why people want fake nails. I always carry and X10 magnification lens and a tape measure. Sleeping during the day makes me feel ill so it takes a decent flu or migraine to make that an option. I don’t like skivvies. My mother used to make us wear them over our bathers to protect us from harmful sunrays. In Australia, this is a good thing, but instead I recommend a button up shirt. What’s worse than wearing a skivvy? Removing a wet one. I have no criminal record. Not even a parking ticket. I was once chastised by an off-duty policeman for jay walking. I suspect he wouldn’t have approached me if I was a 6’6″ rugby player. I have been teased for being white. Or at least, whiter than everyone else. Time has always moved too fast for me, even when I was a child. My greatest fear is to lose those I love. I’ve only ever had two jobs in my entire life. The first I had for 13 years. As a youngster, my mum was furious when she found out I saw the original Mad Max film at a friend’s house. I don’t remember it. However, the 1959 Disney movie The Shaggy Dog gave me nightmares. I loved my Barbies for their hair. I cracked the necks of two Barbies with over-brushing. I did not become a hairdresser. One day I hope to get a dog, I hope the cat will approve. Our first family cat was slightly psychotic and used to ambush my mum when she got home from work. I’ve only ever lived in two houses – the one I grew up in and the one I’m in now. I’ve house-sat three times. I own fifteen bibles/prayer books, fives crosses and two sets of rosary beads but I’m not religious. My skin is hypersensitive. Light touch will tickle me and/or make me itch. When I was three I was stung by a bee because I thought it was lovely and wanted to play with it. I have more types of sugar in my pantry than I do tea – white, raw, brown, castor, demerara and icing. I only use them for cakes or desserts. My favourite meal is my dad’s chicken roast. I have a tendency to accidently switch words around in sentences. My closest friends are my family. I prefer baths to showers. I’m a pyro at heart. I love candlelight. If there’s something to be lit, I’m lighting it, if there’s something to be stoked, I’m stoking it. I always volunteer to light the candles on birthday cakes. I dislike that burnt charcoal flavour. I take my bread barely toasted and even avoid marshmallows cooked in an open fire. Our cat sleeps in the bathroom and has five cat beds dotted around the house. Sometimes he uses them. We’ve never bought a television, we’ve only ever had hand-me-downs. I have tinnitus – my silence hums. I love, wonder and am mesmerised by nature but struggle with gardening. When I choke on something, or after food preverbially ‘goes down the wrong way’ I always sneeze. Always. So. What fifty facts don’t I know about you?